In 1926 Edwin Hubble developed a diagram for classifying galaxies by their “morphology,” or in other words, their shape. The diagram has come to be known as Hubble’s “tuning fork” diagram because of its resemblance to the metal tools used by piano tuners to produce a standard pitch. 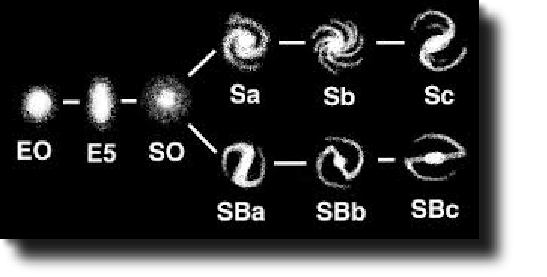 Hubble’s sequence, shown below, classifies galaxies into three main types: ellipticals (left), spirals (right), and lenticulars (an intermediate case). Let’s warm up with some questions to help better understand the way galaxies are classified in Hubble’s scheme. These questions are reprinted on the journal pages. See links at the top of the page. The galaxies are sorted into categories starting with E or S on the diagram. What do you think these capital letters stand for? Hint: What’s the difference between the shapes of the galaxies on the left, versus those on the right? The galaxies on the far left range from E0-E1-E2-E3-E4-E5, although only E0 and E5 are shown. What do you think the numbers indicate? Can you describe the shape of the S0 galaxy in words? What makes it different from the E’s? What is the difference between the upper and lower forks on the diagram? And what do they have in common? What do you suppose the “B” stands for on the lower fork? Hint: It’s another abbreviation for a feature these galaxies each have in common. What about the lower case letters a, b, c? Can you describe in words what progression in shape that these letters are meant to represent? Let’s return to the organization diagram you created for your Galaxy Zoo images. Consider the following questions. What similarities and differences do you observe between your classification and Hubble’s? Did you use any characteristics to sort your images that Hubble did not use? Try sorting your images to match the Hubble diagram. Describe the results. Are there any positions on the tuning fork where you have no examples? Do you have galaxies that don’t seem to fit on the tuning fork? What do you think the cause is? Does the organization of the tuning fork diagram reveal something about the underlying science that controls what shape we see for galaxies? When Edwin Hubble observed his organization plan for galaxies he saw an evolutionary sequence. In other words, he saw a series of steps a galaxy would pass through as they age. What evolutionary sequence do you think might be possible when you look at the tuning fork diagram? Astronomers now realize that the tuning fork diagram does not represent an evolutionary change over time that galaxies go through. The story of how we have come to our present (and still changing) understanding of galaxy change continues in Expedition Galaxies. Why do you think we still use the tuning fork diagram today if it didn’t provide a successful model for galaxy evolution?